Today Garance Dore posted this photo on her street style photography blog. I’ve been seeing gorgeous bright patterns like this a lot recently, and I’m really feeling it. For example, Suno is a clothing line by Max Osterwies made out of vintage Kenyan kangas, which are big rectangular pieces of cloth printed with bright designs and a sometimes cryptic Swahili proverb or phrase. In Kenya and Tanzania they are used as all-purpose sarongs, bundles, headwraps and baby backpacks, but Osterwies turns them into tailored jackets, skirts, dresses, and even bikinis. Kenya used to have an active garments and textiles industry, which has all but disappeared today, so it is especially nice to know that these clothes were made by local tailors and artisans for a good wage. Similarly, I was at Renegade Handmade in Wicker Park awhile ago and saw some amazing skirts and bags made of vintage African textiles by the Canadian artist Les Enfants Sauvages. I also saw her booth at the Renegade Craft Fair in September. Check out her etsy shop for cool, modern shapes made of colorful African and Indian textiles like old saris. Can’t login to your Gmail account? It’s driving us crazy too. But consider this your invitation from the Google Powers that Be to take that latte break, power nap, or much needed stroll down procrastination lane. In fact, we’ve rounded up a few great sites to browse that are just perfect for those days when Gmail tells you “enough is enough”, or, well, “could not complete your request”. Nice pictures of cool things. My guilty pleasure. It’s a news aggregation service that provides mostly tabloid level stories– but with pictures! Mindless. Free. Rice. And somehow you’re also helping to save the world. An up to the minute compilation of hard-to-believe-they’re-true news articles from around the world. Inspiration for your home. It’s very DIY yet modern. If these links just aren’t cutting it for you and you really, actually, do have something you’ve just gotta send out, here’s a way to get around the 502 error. Simply head over to iGoogle, and you can read and send messages via the dashboard’s gmail link. What do you do when your Gmail is down? Layers! The look this season is all about topping on those accessories to create a fresh, sophisticated look. Start with a long tank or tee, top it with a hipster blazer, throw on some eye-popping jewelry with a headband and you’ll look on-the-go stylish. What’s one item everyone must have? A pair of boots. Leather or suede, the material doesn’t matter; neither does the style. Boots with buckles and layers include much of what this season’s look is all about. In a perfect world, I’d recommend you have a pair of scrunched black suede boots to wear on a trendy night out on the town, and a pair of brown leather boots to wear for a simple daytime look. Boots can make an outfit happen. What should you keep in the closet? This season, I’d keep those UGG boots everyone has in the closet. The new vintage trend is all about individuality and expressing oneself. If you want to follow these fall trends, you need to dig a little deeper and search harder for what’s out there. Instead of going to the same department store every year for clothes and shoes, try going to a thrift store – you never know what you may find. What is the inspiration of the fall 2009 trends? Edgy Biker Chic: Acid washed or dark skinny jeans, paired with a graphic tee and layered with a leather jacket. This look is vintage inspired from the 70s for a free spirited soul with lots of charisma. Log Cabin Chic: This look is designed for anyone looking for a down-to-earth, laid back style this fall. Plaid shirts, boyfriend jeans, and a pair of retro sneakers and a bandana will make this outfit have a personality of its own. Girly Chic: Colors, ruffles, pleated skirts- this 50s inspired look is simply adorable. Find a pleated skirt and pair it with black tights, a ruffled moth-colored top and a headband and it’ll look cute and attention seeking for all the right reasons. So if you haven’t already, get started on shopping for this season’s trends. Don’t forget to start in your closet. Every weekday morning, I walk by the dog run in Madison Square Park on the way to the subway. Sometimes I see office workers from the nearby financial firms practicing tai chi, sometimes I see a man walking his cat, and sometimes I see country music bands setting up for a mid-morning concert. But I was unprepared for the chihuahua and his red running sneakers. At a moment when the recession seems like it might never be over, florescent red shoes lighten the mood of even the most jaded Manhattanite. With more muted colors for fall, red shoes are the ideal way to add a punch of color to a staid outfit, and to remember that even when the economy is tanking, we can still have fun. Title from “The Red Shoes” by Kate Bush. San Diego is unique as a California city, lacking the pretension of LA and the cold fog of San Francisco. Still, the laid-back nature and temperate climate are only part of why I love it here so much. To me, San Diego is a vintage city, always drawing on its past to create a unique and eclectic future. Maybe I just like my city like I like my closet. There is something to be said about each neighborhood and borough within San Diego, but the one I keep coming back to is Hillcrest. This is where I find the best food, theatre, and people…and shopping. From the premier vintage at Wear It Again Sam to the fantastic thrifitng at Flashbacks, the thoroughfare of Fifth Avenue represents the best in California style, and San Diego attitude. Frocks and leggings are good, a trapeze dress is better. A closet staple since the ’60s, their simple silhouettes make them a perfect day-to-night…even better for beach to city. Shorts are a necessity for the sunny summer days, and can be dressed up, dressed down, or completely customized. A classic casual with a t-shirt or tunic, and a cropped jacket for a bit of texture. Sandals are nice, and so are heels, but I’ve been told they work best as a team; along with big, colorful accessories. It’s not that any of this is unique, it’s the way it all comes together. Colors and textures take president over cut and silhouette, and more often than not, too much is just about right. The fashion I find in Hillcrest represents the best of what the neighborhood has to offer: diversity, a willingness to stand out, and the perfect mixture between casual and vibrant. That’s my preview into the best San Diego has to offer. More to come as I begin writing for Avant Gaudy. I’m excited to see what’s to come! One of the great triumphs of last summer my life was when I convinced my boyfriend to purchase a vintage-esque fedora at Target. While I do like the look of menswear on women, it’s not something I wear too often. Carly of Immersed Within shows us how. The last place I visited on my annual trip to New York City was the Village, my absolute favorite neighborhood. Why do I love it so much? 1. Really really good pizza (John’s Pizza—you have to get the house salad and the meatballs in addition to the pizza, they are delicious!). 2. Washington Square Park—I love watching people walk around with their dogs. 3. The fashion, of course. Plaid was everywhere. Shirts, dresses, headbands, even on a pair of leggings. And it wasn’t your normal red and black checkered print. I saw more teals and purples than reds and whites. My favorite plaid outfit was a long purple and black plaid shirt with rolled up sleeves, shiny black leggings, and a thin black belt. Oh, and of course, you can’t forget the Ray Ban Wayfarer sunglasses (I saw them on literally everyone there). I love this look because it is so trendy, but very easy to replicate. I also saw a lot of ruffles, something I’ve seen Louis Vuitton incorporate in his fall runway shows. 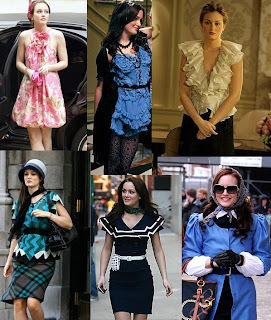 Ruffles are such a fun, easy, and affordable trend that even the fashion-challenged can pull off. It is now one of my staples in my closet. A majority of the outfits I saw there were much looser silhouettes than anywhere else. Boho frocks with unique patterns and long necklaces were common. I also saw jumpsuits—a trend I thought would never be popular. I was wrong. This one from Avant Gaudy looks almost exactly like the few I saw around in New York. I think Village style is all about looking good without trying too hard. To me, everything seems a little more relaxed and comfortable, which leaves room for more unique, individual styles to shine through. I could tell that a person that loves vintage clothing would fit perfectly in the Village. Yes. Velvet is coming back this fall and it’s no longer reserved for girls under the age of 12. Use velvet in your wardrobe to create sophisticated looks that are classic and feminine with a hint of toughness. The runway was full of this luxurious fabric this season with dresses, blazers, and even pants from designers such as Marc Jacobs, Fendi, Armani, DVF and more. Can’t afford designer prices? Try these vintage pieces from Avant Gaudy. Style Tips: Be careful not to overkill the trend by wearing too much. One statement piece of velvet is enough for an outfit. Try a velvet blazer over skinny jeans and a sheer romantic blouse under to avoid feeling stuffy. Try a shorter jacket over a frilly dress to add a bit of edge. A velvet dress with a pair of heels makes for perfect evening attire. You know what my favorite kind of velvet is? RED VELVET CAKE! SO good. Here’s an awesome recipe from allrecipes.com. After spending the day in the Bronx, I decided I wanted to spend a couple hours roaming around Midtown. I love the fact that in Midtown, no one slows down for anything. It’s also a great place to spot fashion trendsetters. Many women wore high-waisted pants and skirts—a trend I’ve seen both Chloé and Stella McCartney incorporate into their runway shows. I also saw a lot of dresses and tops that emphasized women’s shoulders. That doesn’t mean you should dig out old jackets with shoulder pads stuffed inside them. Instead, women are giving the old trend a revamp by wearing puff sleeves and jackets with sharp angles at the shoulders. Light, summery scarves, long strands of pearls, and belts worn high on the waist are still the go-to accessories in Midtown. I couldn’t walk a block without seeing one of the three. Even finding people wearing all three wasn’t hard to spot. Lastly, and one of my favorite trends, are men dressing especially classy. I’d like to partially attribute this popular trend to the television series Mad Men. The men in that show are so well dressed! Well, actually, all of the characters are well dressed. (If you aren’t watching it already and you love classic/vintage style, you must watch this show. Oh, yeah, and the acting is good too.) Anyway, I saw so many men dressed in sharp suits, but just like women’s fashion, men were sneaking in pops of color without being outrageous. Subtle pinks, purples and vibrant greens acted accent colors in ties or pocket squares. Those are the latest trends I’ve spotted off the streets of Midtown. Next time, the Village—my favorite neighborhood in New York. Many people believe that harem pants are one trend that they can’t pull off, but really anyone can! Harem pants are loose fitting pants that are slightly tapered and tight around the lower leg. Harem pants were featured on the runway of designer Amy Smilovic this spring, but the trend will still be popular this fall. Harem pants were also seen on the runways for Balmain and Christian Dior this fall. Harem pants can look nice with a tank top or long-sleeved shirt and colorful, high-waisted belt. Harem pants are a great way to show off your fun, outgoing side and a perfect for someone who wants to try something different. Harem pants can range from $19.99 (Urban Outfitters) to as high as $550 (Sonia by Sonia Rykiel). Check out these unique harem pants from Sonia Rykiel, Urban Outfitters and Forever 21.